The big news this week was the birth of Prince George Alexander Louis, the new Duke of Cambridge. Plenty of sleepless nights certainly await the Royal parents; so this new collection of lullabies may be just what the royal doctor ordered. In German, it's wiegenlied; in French, berceuse; in Norwegian, vuggevise. In any language, the universal effect of what we know as the lullaby is, of course, to coax a baby to sleep. 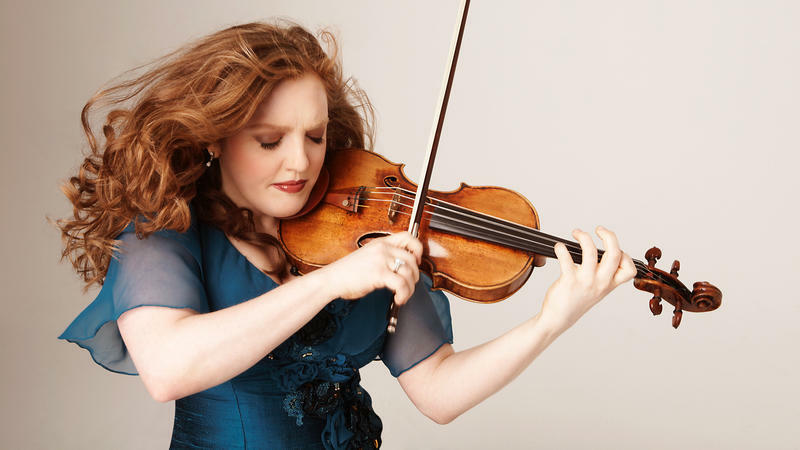 Violinist Rachel Barton Pine had her own baby in mind when she decided to record a collection of lullabies. Her infant daughter appears on the cover of the new album Violin Lullabies — all folded up, fast asleep, so tiny she just about fits in her dad's hands. The question—What Is American Classical Music?—comes to mind on Now Is the Time, Sunday, August 18th at 10 pm. The Symphony No. 1 of John Biggs is in the grand tradition we think of as “American,” with wide-open sounds and deep breaths from the prairies—first brought to us by Virgil Thomson of Kansas and Aaron Copland of Brooklyn. It’s as American as it gets. The music of John Biggs grows honestly out of this tradition, but the very day in 1963 that the middle movement was completed, President John F. Kennedy was assassinated. This Passacaglia of this American symphony, often performed separately as a memorial, lends added resonance to the entire work. Carol Barnett takes two worlds that ought not go together—and makes them go together. The World Beloved, A Bluegrass Mass is remarkable because of its integrity. This is no simple Mass-with-a-banjo. Text is interpolated between the sections of the Mass, and the total result is solid, colorful—and uplifting. The bluegrass band Monroe Crossing joins Philip Brunelle’s VocalEssence in a work that could only have come to light in America. Stark contrasts play against each other on Now Is the Time, Sunday, August 11th at 10 pm. Zeitgeist performs In Bone-Colored Light, Jerome Kitzke's illumination of a late afternoon in an American landscape. Gabriela Lena Frank opens up the Indian and Spanish cultures of Peru for "Holy Mary, let's go dance," or Ccollanan Maria, a sighing, gospel-inflected work sung by San Francisco's Volti. Maggi Payne finds music in sounds from the environment, processes them electronically, and attractive surprises result in System Test (Fire and Ice). And from Curt Cacioppo's recent CD Italia, Network for New Music performs Colomba Scarlatta della Libia, or Red Dove of Libya, a bubbling work of shadow and light. Unusual ensembles blend their voices on Now Is the Time, Sunday, August 4th at 10 pm. W.A. Mathieu vaulted into stardom among jazz cognoscenti when, at 22, he wrote all the arrangements for the 1959 Stan Kenton album Standards in Silhouette. He went on to help found Chicago's Second City improv troupe, and writes music and books melding Western and Eastern traditions. For All sets Gary Snyder's original Buddhist- and Native American-tinged poetry, as well as a translation of Chinese poet Han Shan. The early-music Galax Quartet, combining gut-stringed violins, cello, and viola da gamba, accompanies contralto Karen Clark. Ezra Laderman writes for an orchestra of cellos in Parisot, named for the director of the Yale Cellos, Aldo Parisot. Laderman further subtitles the five movements for cellists Gregor Piatigorsky, Pablo Casals, Emanuel Feuermann, János Starker (who died in April 2013), and Parisot. A cello ensemble produces one of the most beautiful out-of-the-box sounds in music, and Laderman varies the texture and motion exquisitely.